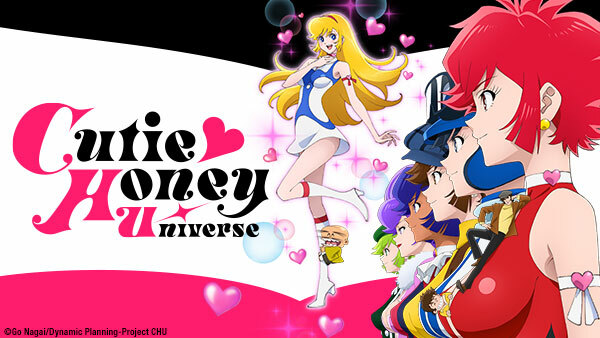 Sign up now to stream Cutie Honey Universe, subs, tons of dubs, OVA's, simulcasts, plus the all new Dubcast℠ editions and more! Panther Claw is at it again and this time, they've taken hostages! Honey jumps into action with the help of some new friends but not all of them are who they claim to be. While training together, Honey and Inspector Genet learn more about each other. However, Seiji becomes Panther Claw's newest target and it's up to Honey to save him! Natsuko and Inspector Genet decide to spend more time together and are attacked by Panther Claw! With Genet nowhere to be found, will Honey save her friend in time? Cutie Honey gets tangled in Panther Claw's web and is taken back to their headquarters! But is it Honey or Panther Claw that's truly in danger? After learning about the mayor's sinister motives, Honey and Seiji start investigating and quickly find themselves neck deep in trouble. Sister Jill's plan to capture Honey blossoms as Panther Claw begins their attack on Honey's school. In the aftermath of the attack on her school, Honey has a hard time dealing with everything that happened. Nat-chan makes a startling realization about Genet-san. Natsuko processes her thoughts after learning new information about Honey. Tarantula questions her feelings towards Panther Claw. Honey and the PCIS team race against time to find the hostages Panther Claw has taken. In the process, Honey discovers there is much more at stake. Honey won't stop until every member of Panther Claw pays for what happened but, despite her rage, she welcomes some unexpected guests. Determined to stop Sister Jill at all costs, Honey ventures to the Panther Claw lair where she learns a terrible truth. Honey learns the true power of her Airborne Element Fixing Device.